The cost is the very important factor for the patient but before knowing the cost of hair transplant the patient should be aware that the hairs are the most important part of one’s life, his/her looks depends on that, hair loss can equates in the loss of confidence and the personality. Most important the cost of Nutrite FUE hair transplant is totally depending upon the complexity of the hair restoration so its cost differs from the patient to patient. Dr Talwar Cosmetic surgery is in the field for over 20 years and has done more than 2000 hair transplant surgeries. He is more concerned about the patient’s desires & wish so he’s able to achieve the patient’s expectations. 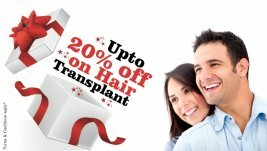 At the time of the consultancy Dr. Talwar will give you the best advice regarding your hair transplant and the cost will be finalized according to your outcomes.